You know it’s spring when the annual Easter egg donation from United Egg Producers rolls around. Thank you, Herbrucks Poultry Ranch and Sunrise Acres, for giving more than 200,000 eggs to West Michigan families in need! Check out the full story at the link below. Doug Patmos and Jeff Armstrong (both on the right) delivering eggs to Feed America West Michigan location in Comstock Park. 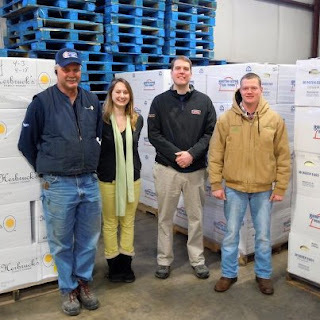 Herbruck’s and Sunrise Acres are the two largest egg farms in Michigan and both made generous donations to the food bank. Eggs contain only 75 calories and at about 12 cents each, eggs are one of the most affordable high-protein foods.